Now the reacher preferred by professionals is available to everyone. 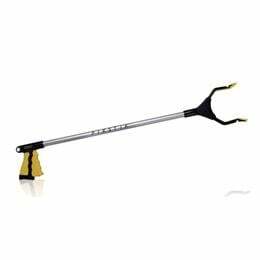 PikStik Pro is a multi-purpose reacher designed for all uses. Our patented design is strong, lightweight, safe and availble in multple sizes. Wide 5 1/2" jaws pick up larger objects than any other reacher. Designed for ultimate safety with no sharp edges to pinch fingers. Handle locking mechanism saves hands and fingers from strain. Item # A-16-204 : 20"